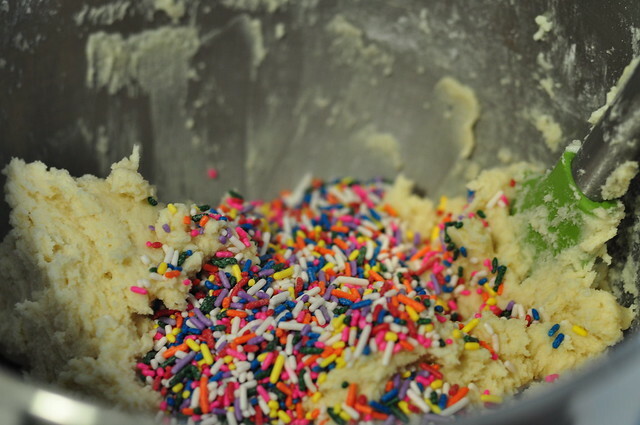 When I was a kid, I didn’t really like sprinkles on my cakes. I just thought that the texture was weird and it didn’t taste like anything, so what’s the point? I didn’t care for how it made cake more appealing or how festive they can be. Now that I’m older, I can appreciate the use of sprinkles, even embrace it. 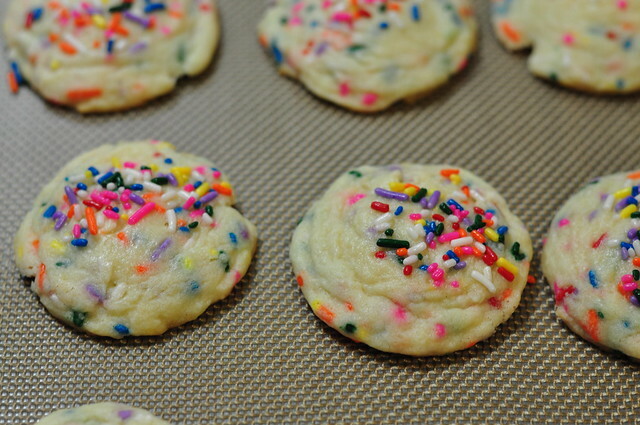 That’s why I decided to try these funfetti cookies. They can really brighten a person’s day. These days, it’s all about making someone’s day just a little bit better from the life problems that we all have. 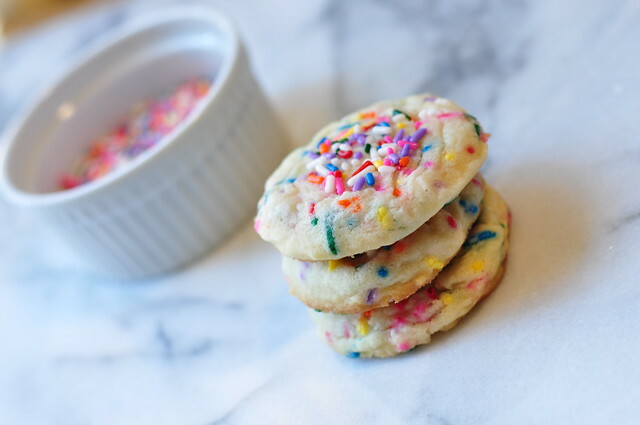 They taste pretty much like the sprinkle cake mix you can buy in the grocery store, but in cookie form. I really think it is the imitation butter flavor that makes the cake flavor pop. I haven’t tried just using more real butter, but maybe next time, and there will be a next time. Not only is it an easy recipe to follow, they’re fun to make too. 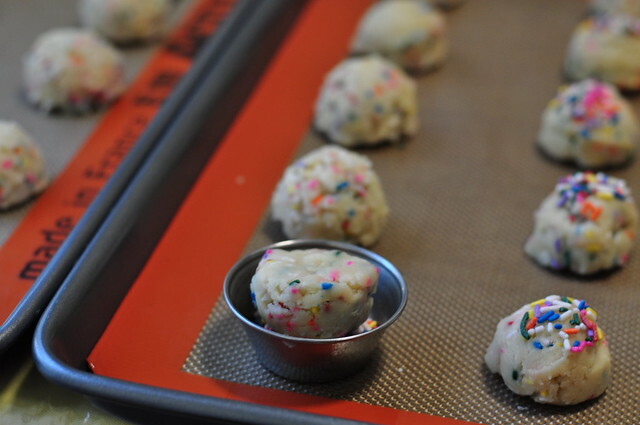 In addition to sprinkles in the dough, you get to dip the cookies in even more sprinkles! This makes the cookie look even prettier. Look at how beautiful these turned out. Yammie’s blog really amazes me. She makes most of her recipes up, and these cookies are so delicious. Hopefully someday, I can get to that point where I’m good enough to create my own cookie recipes and be good! Beat the butter and sugar until thoroughly combined, about 5 minutes. Add the vanilla, butter flavor, and egg. Beat until combined. In a separate bowl, sift the flours, baking soda, and salt together. Slowly add to the butter/sugar mixture. Chill the dough for about an hour. If you’re in a hurry, throw it in the freezer for 15 minutes. 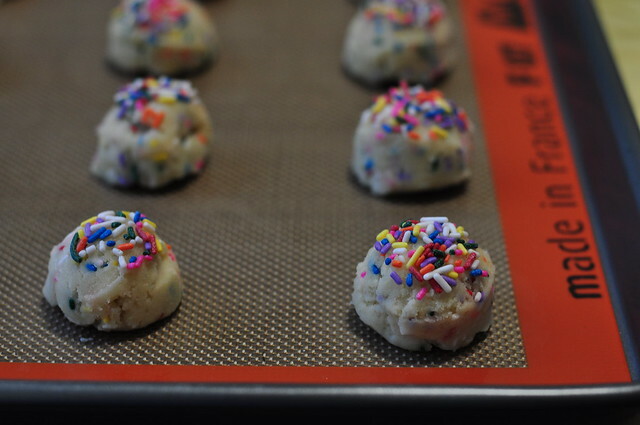 Preheat the oven to 375 degrees F. Take about a tablespoon of dough (or use a cookie scooper), dip that in the sprinkles and place on the baking sheet. Repeat until the sheet is filled. Bake about 7 minutes. Keep the remaining dough in the freezer while the others are baking. Keeping the dough cold will help keep its shape better and won’t flatten out as much, since they will flatten out as they bake. 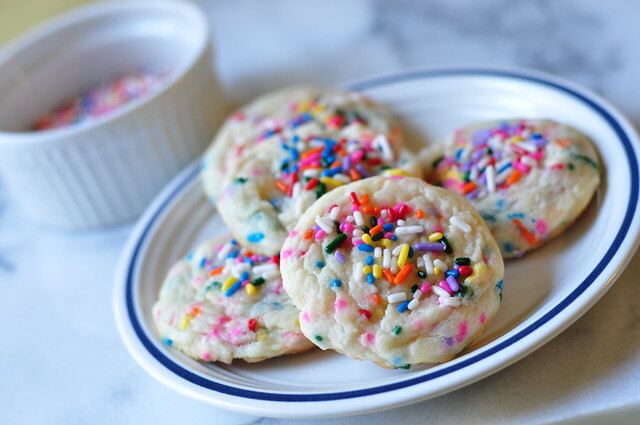 This entry was posted in Cookies, Recipes and tagged baking, cookies, funfetti, recipes on March 24, 2013 by Krystal. Your cookies look so cute – and totally yummy!